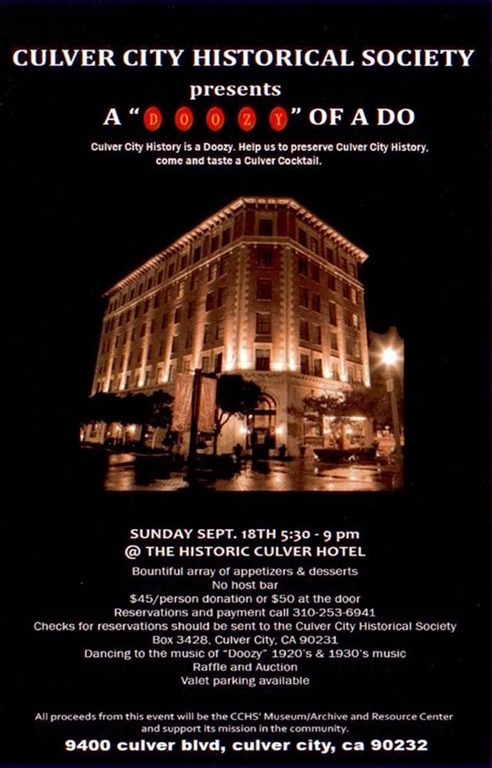 The Culver City Historical Society will present a celebration of the city’s 94-year history that promises to be a real doozy at the newly-renovated Historic Culver Hotel at 9400 Washington Boulevard, Culver City, on Sunday, September 18, from 5:30 to 9 p.m.
Festivities will include music and dancing to the music of “Doozy,” a band specializing in “prohibition pop, depression era tunes, and retro-originals” every Thursday evening at the Culver Hotel; bountiful arrays of appetizers and desserts; a raffle and auction; silent movies; historic Culver City cocktails at a no host bar, and many more surprises. 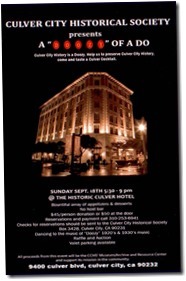 The auction and raffle will be conducted by former mayors Jozelle Smith and Andy Weissman, and will offer Culver City memorabilia and other items. 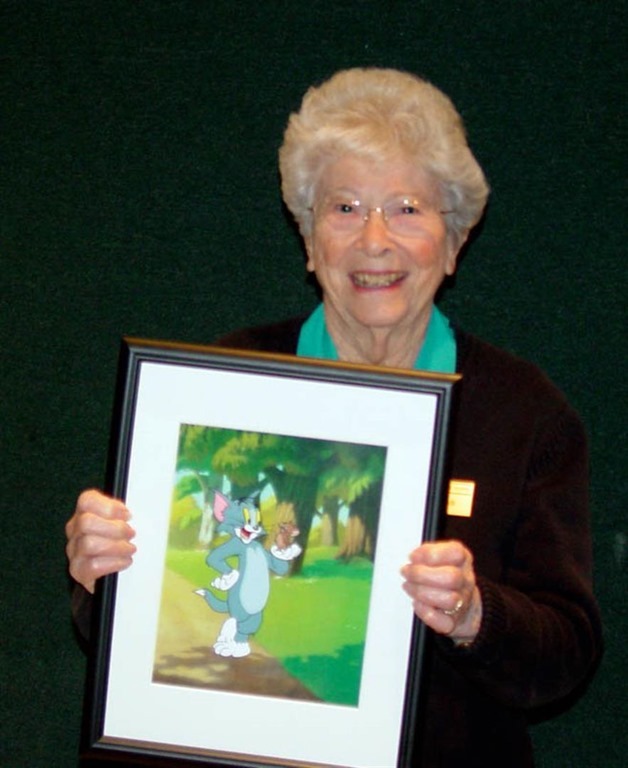 The highlight of the auction will feature a hand-painted Tom and Jerry animation cel made by longtime Culver City resident Martha Sigall especially for this event. 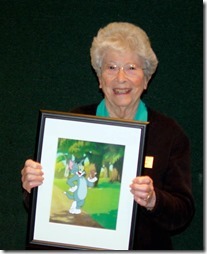 Sigall worked for some 14 studios during her career and took part in the development of characters like Daffy Duck, Bugs Bunny, Elmer Fudd, and Tweety. “This is a wonderful opportunity to come out and celebrate the city’s 94th anniversary in such a great town for all of us who live and work here, and to support our local historical society and its mission in the community,” said Stu Freeman, Culver City Historical Society president. The public is invited to attend and encouraged to wear costumes of the 1920s and 1930s. 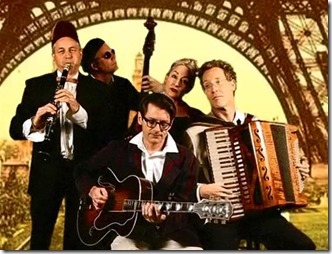 Tickets are $45 per person and reservations are required. 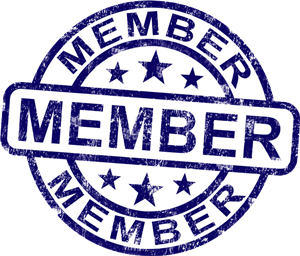 Checks for reservations should be sent to the Culver City Historical Society, Box 3428, Culver City, California, 90231-3428. (Admission is $50 at the door). Tickets may also be purchased at the CCHS’s Archives and Resource Center (ARC) on Saturday, September 3 from 1-3 p.m.
All proceeds from this event benefit the ARC and support its mission in the community. Don’t miss the Fiesta La Ballona this weekend; ARC open Sat. & Sun.